There was not even yelling allowed while shooting "Wonder" and actress Izabella Vidovic found it easier to portray that kindness on screen in such a work atmosphere. Playing Via the older sister of Auggie who has to be in the background was a different experience than Vidovic had anticipated. "It took research and talking to families, siblings that were living Via's life," Vidovic said. "I think the hardest part was just understanding Via's position and how it feels, what its like to be in a family where all the attention is going to be geared towards your younger sibling." 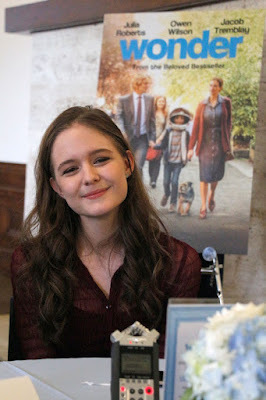 Via's selflessness can be a daunting task to portray, but Vidovic read the book twice and had so much to base the character off of, as well as director Stephen Chbosky to guide her, that the role comes off endearing. "Wonder" has such a profound message that Vidovic feels honored and fortunate to have been a part of this project which can have people being appreciative of the kindness and tenderness. "I didn't read the book before I read the script, so (the script) was my first introduction to the story," Vidovic said. "I was crying so much, first when he goes to school and he has such a terrible experience, then with Daisy dying, that ripped my heart out, and then the ending which was happy tears." The story is such an emotional rollercoaster and the filmmakers and cast were so involved that on set it felt that everyone was invested in the story, which Vidovic hopes comes across. Seeing everyone apply kindness, spread kindness and be nice to everyone inspired Vidovic while onset. Although the story centers on Auggie, each character has an opportunity to have their point-of-view expressed, which Vidovic thinks helps audience members connect even further with the story.